For all of you who are working on your resolution that includes being more healthy, losing weight, saving money, eating more organically, this recipe hits them all! It's super yummy and you can make a big batch so it lasts a week. 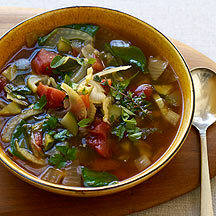 It's great in the cold winter months and if you have a pile up of veggies in the fridge looking for their purpose! We sign up for a weekly organic vegetable service and we get whatever is in season. This was the first time I actually got to use the kale before it went bad while I was "researching" what to do with it. For me, this is a great way to use all the veggies up. You could add chicken and rice to this recipe as well but for those of you who are looking for a complete guilt-free meal, just use the veggies (0 points for WW). I am going to give you the recipe but I don't follow it too closely. I just throw in whatever veggies I like or have, eyeball quantities and throw in spice until I get it right. I generally make too much so maybe this last batch i will try to freeze. *I also add a few shakes of crushed red pepper for a little kick. *I have made the above exactly to the recipe. Very yummy. However, this week, I skipped the zucchini and green beans and instead added broccoli, potato, kale and leeks. Just use what you have. In a large saucepan or dutch oven, spray with non-stick cooking spray. Saute the carrot, garlic and onion until soft. Add broth and veggies (not zucchini), tomato paste and spices. Bring to a boil. Reduce heat, simmer and cover for about 15 minutes. Stir in zucchini (if using) and heat for 3-4 minutes. Serve. It's great to eat right away or just make a batch for the week. I would like to give credit to Weight Watchers for the original recipe and my Aunt Carol for actually showing me how simple and yummy it is. Share your tips and variations!